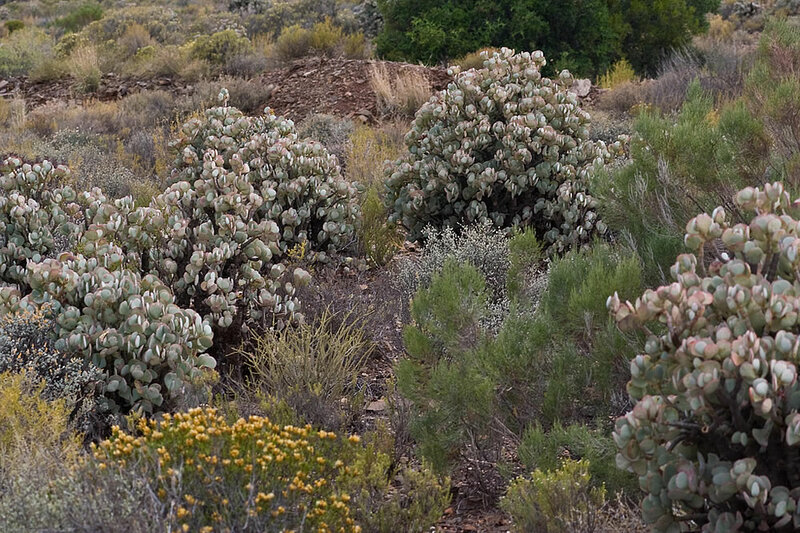 Distribution and habitat: Crassula arborescens is an endemic plant of the Western Cape, South Africa. 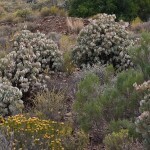 These plants often occupy large areas on hills, slopes and sometimes cliffs, but are also found in valleys but with a preference for sunny and exposed situations. Plants that occur on slopes or cliffs easily lose parts of their branches and these can root freely and develop into separate colonies. It is not uncommon therefore to see dense populations of Crassula arborescens along its distribution range. Description: Crassula arborescens forms a stout, trunk-like stem up to 1m (3 feet) tall, which carries well balanced branches bearing fleshy, almost round leaves that are grey-green with transparent dots and reddish edges. They are 2-5cm (0.8-2 inch) across. The balance of the branches is a distinctive feature of this plant. 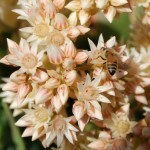 Flowers, which are quite rare in cultivation, generally appear in spring; They are tiny but numerous, star-shaped and can be many shades from white to deep pink in colour. Houseplant care: No training or pruning can improve Crassula arborescens perfect tree-like appearance. Light: Crassula arborescens plants need bright light with some direct sun light. A sunny windowsill will be an ideal position for these plants. They will not flower without sunlight and inadequate light will cause developing spindly growth. 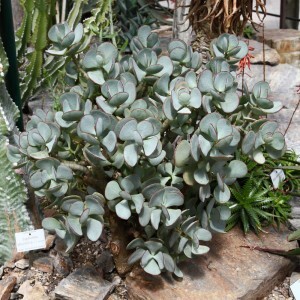 Temperature: Most Crassula arborescens grow well in either warm or cool positions, but should not be subjected to temperatures above 12°C (54°F) during the winter rest period, when they can tolerate temperatures down to 7°C (45°F). Give ventilation in summer and stand outside when conditions are favourable for Crassula arborescens plants – enough hot and sunny. Watering: During the active growth period water Crassula arborescens moderately, enough to make the mixture thoroughly moist at each watering and always allow two-thirds of potting mixture to dry out between waterings. During the rest period water only enough to keep the potting mixture from drying out completely. Feeding: A long term slow release fertiliser should be stirred into the potting mixture when repotting. No extra feed in necessary. Potting and repotting: Use a mixture of tree parts of soil based potting mixture to one part coarse sand or perlite. Crassula arborescens should be moved into pots one size larger only once every two years. It will require a maximum pot or small tub size of 20 or 25cm (8-10 inch). Propagation: Individual leaves of Crassula arborescens will root readily in the recommended sandy potting mixture if kept in warm room in a position where they can get bright filtered light, but more satisfactory way to propagate in by 5-8cm (2-3 inch) long stem cuttings or basal offsets. The cuttings or offsets should be taken in spring. Plant it in a 5-8cm (2-3 inch) pot of equal parts mixture of peat moss and sand and keep it at normal room temperature in bright filtered light. Water the cuttings or the offsets moderately, just enough to make the potting mixture thoroughly moist and allow the top couple of centimetres of the potting mixture to dry out between waterings. Give it some standard liquid fertiliser about once a month. White woolly patches on the leaves are caused by mealy bug. 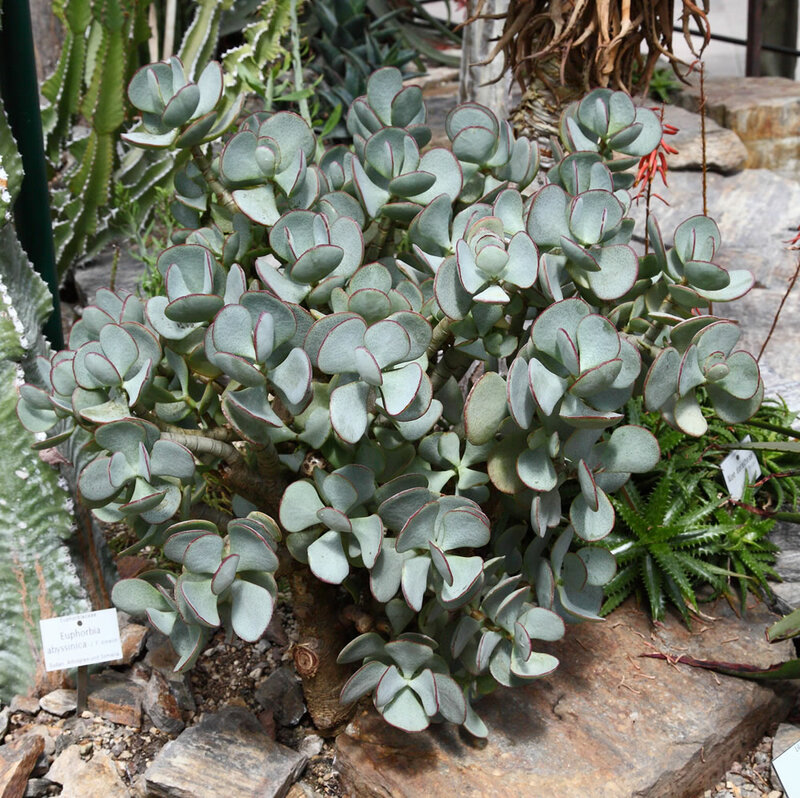 Uses and display: Crassula arborescens has a very attractive appearance in both its natural habitat and cultivated gardens. 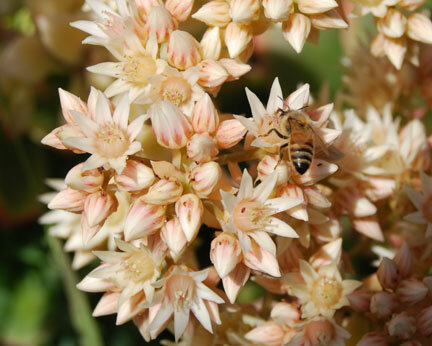 It is cultivated as an ornamental plant for use in drought tolerant and succulent gardens and in container gardens. It is very popular plant in rock gardens and on rocky embankments. Besides their attractive flower clusters, they look delightful with their contrasting blue-green foliage, especially when used in combination with other dark green shrubbery. It is also suitable for growing indoors as a houseplant.